Posted on April 3, 2018 · Richard Welch operates the fireworks at Minute Maid Park during Houston Astros games. 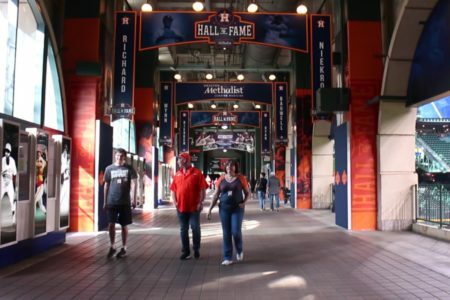 Posted on November 3, 2017 · We meet the voice of Minute Maid Park, public address announcer Bob Ford. Posted on November 3, 2017 · Richard Welch operates the fireworks at Minute Maid Park during Houston Astros games. Posted on September 18, 2017 · The Astros clinched the American League West title with a 7-1 victory over the Seattle Mariners Sunday and are bound for the playoffs. Posted on July 25, 2017 · While the 2017 Astros bear little resemblance to what we saw from the ball club just a few years ago, there has been at least one constant for the ‘Stros for more than 20 seasons now, as Houston Matters’ Michael Hagerty told us last year. Posted on July 17, 2017 · Richard Welch operates the fireworks at Minute Maid Park during Houston Astros games.